Reggie: The ice cream is gonna be flyin' fast and furious. Q: I heard there is a three hours director's cut. Is that true? Q: How come everyone in town thought that Tommy had committed suicide when he was clearly stabbed to death? Imaginative, Bizarre, And Thoroughly Entertaining. "Phantasm" is about a young teenager, Mike, who just recently lost his parents. He is worried about losing his older brother, so he follows him everywhere, including a funeral. While hiding in the bushes during the funeral, Mike sees "The Tall Man" (played by the creepy Angus Scrimm), the man who runs the funeral home, pick up a casket by himself. Mike begins spying on the man afterwards, fascinated with uncovering the strange events surrounding the funeral home. While investigating, Mike discovers a strange world within the walls of the mortuary, including flying metal spheres with sharp arrows that drain the blood from your head, and many other horrors. Turns out, the Tall Man is from another dimension, and is taking the bodies of the dead and reincarnating them in his world for slaves. Mike teams up with his older brother and the local ice cream man, Reggie, to stop the Tall Man's gruesome work. 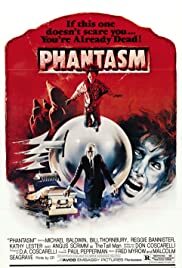 I remember my mother telling me about how much "Phantasm" scared her when she was a teenager, and she rented it one day and I watched it along with her (I was about nine or ten at the time), and it was genuinely one of the most bizarre movies I've ever viewed. Written (as well as directed) by Don Coscarelli, "Phantasm" has become something of a horror classic over the years, and deservedly so. Coscarelli's writing here is so unique that it hurts. Everything in this film is surreal and dreamlike, and the entire plot line is so out there that I can't think of another film that can quite compete in terms of strangeness. But, despite it's strangeness, this movie works, in it's own, weird little way. The script is solid and the characters are believable (there are some real-life situations thrown in as well, so there is some sort of viewer-character connections that can be made), even though about ninety-nine percent of this film is something of pure fantasy. But it's quite a scary fantasy, and that's for sure. There are many elements in this film that have become somewhat legendary, among them being the murderous silver spheres and The Tall Man's "Boyyyyy!" line. The thing is, among all of the randomness that is "Phantasm", this is quite a terrifying movie. A dense feeling of helplessness and foreboding is hiding in every scene, and the cinematography and locations add to this quite a bit. The imagery is bizarre and often very spooky, and the settings are perfect (especially that creepy old funeral home). The viewers themselves are easily caught up in the engrossing story, and the atmosphere is very scary. Michael Baldwin plays our lead hero well, with Reggie Bannister as the ice cream man, and Bill Thornbury as Mike's older brother, Jody. And Angus Scrimm plays his signature role as The Tall Man, and his presence alone makes this film scarier than most of it's genre. And then there's the score to the film, which is equally as effective and just as chilling. The film concludes leaving many questions open-ended and unanswered, but honestly - can you really expect genuine, fulfilling answers when the movie itself is so strange? I think it's good that this film does leave some loose ends, because it goes along with the movie's overall feel. Bottom line - I don't think this movie is for everyone, and it might be just a little bit too weird for some. Honestly, one of the strangest, most out-there films I have ever seen, but in my opinion, that's a good thing. The story is strange but well crafted, and the bizarre imagery and atmosphere make this a painfully unique, scary experience. I can see why "Phantasm" has become such a classic of the genre. For me, this film remains a nice little piece of spooky and original nostalgia, and I'm glad my mom decided to scare the daylights out of me with it at such a young age, because I grew to love this movie later on. 10/10. 43 of 59 people found this review helpful. Was this review helpful to you?